We've all heard that it's not safe to put metal in the microwave. But the fact of the matter is, we often put metals in the microwave—like when we heat up a Hot Pocket, for example. Its pouch has a thin layer of aluminum lining that is designed to absorb the microwaves and heat up a bit to brown the outside of the Hot Pocket. Plus, the inside walls of your microwave oven are made of metal. This forms a Faraday cage, which traps the microwaves inside the box, so that they cook the food and not things around the microwave oven (like you). The microwave window also has metal mesh lining it. The holes in this mesh are smaller than the wavelengths of the electromagnetic radiation your microwave is producing, which keeps the waves from passing through the holes. Visible light, however, is comprised of much smaller wavelengths, so that form of radiated energy passes through the holes just fine, allowing you to see inside your microwave while it’s running without getting cooked yourself. So if the inside of your microwave is lined with metal, and certain food products have containers that contain metal, why does your microwave manual warn you not to put metal in the microwave? At its core, a microwave oven is a pretty simple device: a magnetron hooked up to a high voltage source. This magnetron directs microwaves into the metal box where your food is cooked; the waves bounce around inside the microwave until they are absorbed via dielectric loss in various molecules, which results in those molecules heating up. Substances that work well here are things such as water, ceramics, and certain polymers, which all end up converting microwave energy into heat quite effectively. Metals, on the other hand, are packed with electrons that can move freely, and are therefore great conductors of electricity. When microwaves hit the metal you put in your microwave, free electrons on the metallic surface end up moving from side to side very rapidly. This, in turn, prevents the electric wave from entering the metal, and the waves end up being reflected instead. When microwaves are reflected instead of being absorbed, it can potentially create a sufficient charge density that the electrical potential in the metal object exceeds the dielectric breakdown of air. When this happens, it will result in arcing inside your microwave, from that metal to another electrical conductor with lower potential (often the wall of the microwave). In extreme cases, these electrical sparks can end up burning small holes in the metal wall. The sparks can also end up burning out the magnetron in your microwave oven or, in modern microwaves, can generate a surge that ends up damaging sensitive microelectronics, possibly killing your microwave or making it unsafe to use. 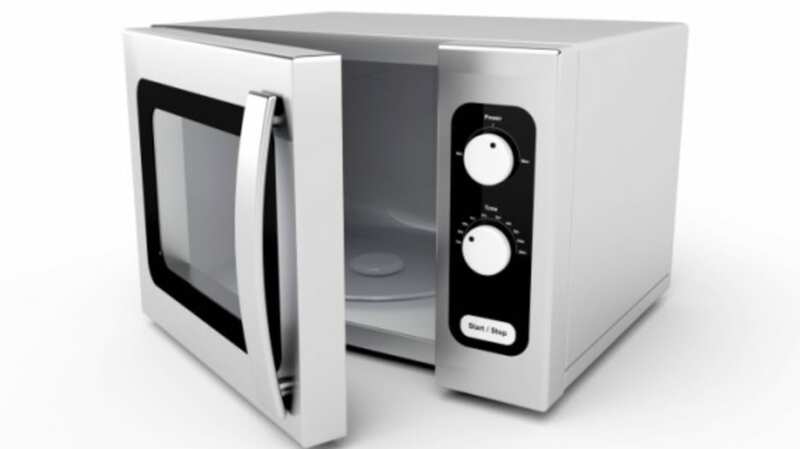 Another way putting metal in the microwave can kill the magnetron is when enough of the generated microwaves don’t get absorbed, which might happen if the food is wrapped in aluminum foil or mostly enclosed in a metal container. If the energy isn't absorbed, it has nowhere to go but back to the magnetron to damage it—which, again, can render your microwave useless. On a more mundane level, putting your food in the microwave with something like a regular spoon or a metal plate means that it probably won't get cooked properly. In general, putting metal in the microwave is unsafe—not because you are at risk of bodily harm (though in extreme cases a fire might be started in your microwave)—but because it could potentially damage your microwave. Just a little something to consider when you're reheating your holiday leftovers.